Reducing the burden of waiting in transit travel is critical to increase the attractiveness of public transportation and encourage people’s shift from automobile mode. Research shows that wait time perception is highly subjective and varies according to various factors such as mode, availability of schedule information or stops amenities. In addition, high-quality environments are known to reduce stress and to encourage walking and biking. Nevertheless, little research exists on the influence of the stops and stations surrounding environment on transit users’ wait time perception. This study aims to respond to this knowledge gap in order to optimize stop localization and micro urban design around stops. The study compares transit users’ actual and estimated wait time at 36 stops and stations offering a mix of environmental situations in the Twin Cities region. 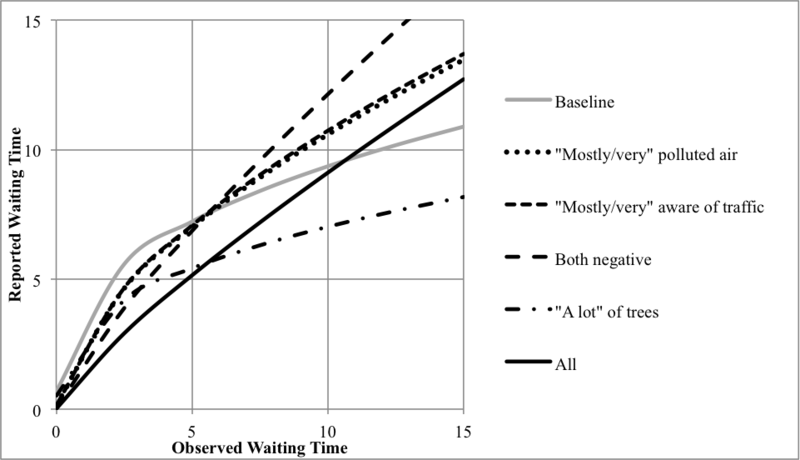 A regression analysis is used to explain the variation in riders’ waiting time estimates as a function of their objectively observed waiting times, as well as stop and station surrounding environment characteristics. The results show that, for waits longer than five minutes, the more the environment is polluted and exposed to traffic, the more transit users tend to overestimate their wait time and that, on the contrary, the more mature trees are present the shorter the wait time is perceived. The combination of the three variables indicates that after 5 minutes wait, the presence of trees achieves to compensate the effects of both air pollution and traffic awareness. Policy implications and further research needs are discussed. Keywords: Public transportation, transit, rail, bus, stop, station, waiting time, time perception, environment, air pollution, traffic, tree, planning, urban design.